Finally the day has arrived to announce that our latest book is now available for order. We are proud of the product and hope many of you will be anxious to read it. We think adults will enjoy the book as much as children or teenagers will. The book is written on the pre-teen reading level. You can order a copy online at the following link: https://www.createspace.com/5114278. Signed copies will also be available from the authors at a Book Launch and subsequent book readings in Vernon, British Columbia, probably in the month of February. Sometime in February 2015 the book should also be available for order online through amazon or from book stores. Unless you want to take advantage of free postage through amazon by placing an order at a minimum of $25, we request that you place your order through Create Space as listed above as we get a larger royalty and you receive the book at the same price and same shipping and handling fees as through other methods of online ordering. For those who want to read the book in an e-book format, we will be listing it on amazon as a Kindle book shortly. Has a pet ever held a special place in your heart? Though written for children, this book will appeal to pet lovers of all ages. It tells the story of Jake, an 11-year-old boy who adopts Little Jimmy, a budgie bird, born without wings. Jake learns to help Little Jimmy live and feel like a very special bird. Later, a rescued baby chick is literally dumped into Jake’s hands. “Thing,” as Jake originally names him, soon insists on his own name, becoming “Louie.” Eventually Big Louie grows into a huge and very smart raven. Though he didn’t want the raven at first, Jake soon realizes that Big Louie has become an important part of the family who comes to the rescue when Little Jimmy gets into dangerous situations. One adventure follows another and the three become fast friends who really love each other. Author Ian Moore-Morrans had ample experience raising his own Jimmy, a cockatiel, from newly-hatched to adulthood. Ian has used that knowledge in portraying realistic characterizations of both birds, including intelligence, comic actions, dependence and independence, plus an ability to “talk” and a knack for finding a very special place within a family. Co-author Gayle Moore-Morrans, also Ian’s wife and editor, has added her own touch to the story, giving a spiritual dimension to Jake’s family and his decisions in caring for and loving his pets. For that special “kid’s touch,” Ian and Gayle invited two of their great-grandchildren to collaborate on Jake, Little Jimmy & Big Louie. Great-grandson Leland German was their age-appropriate consultant and Great-granddaughter Hannah German served as the illustrator. 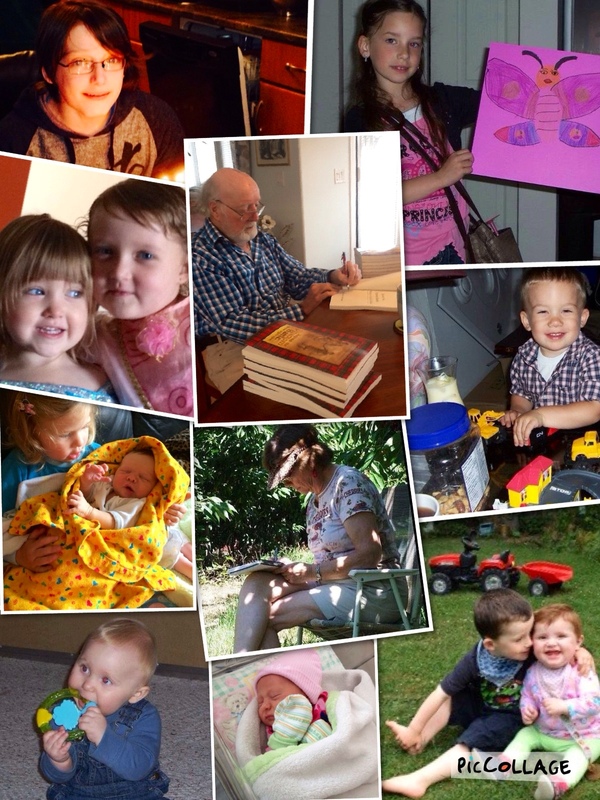 They are pictured at the top of the following collage. 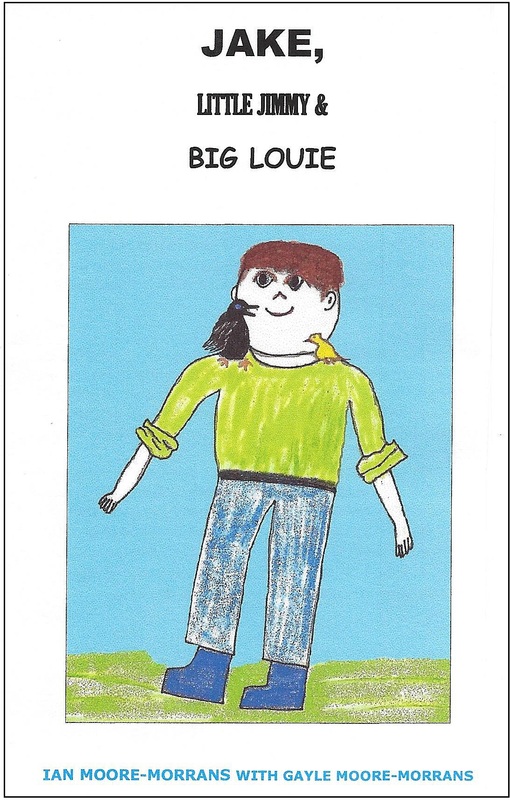 Our book,” Jake, Little Jimmy & Big Louie,” is dedicated to the eleven children in our lives, three of them born since we first started blogging a draft of the book almost two years ago. They are our youngsters (or “wee yins,” as Ian would call them in his Scottish vernacular). In the center is a picture of Ian signing a stack of his books and one of Gayle busy at one of her Location Writing sessions. We are surrounded by photos of these very special children who make up our blended family: from top left and clockwise, Leland, Hannah, Logan, Eva, Gustav, Haylee, Brayden, Alex, Lexi, Madison and Caleigh. We love them all! This entry was posted in Biographical info, Canadian theme, Celebrating, Children's chapter book, Co-authoring, Editing, Event, Illustrations, Inspirational story, Novel, Ordering a book, Publishing a Book, self-publishing, Uncategorized, Writing and tagged "The best laid schemes of mice an' men gang aft agley. ", birds, boy wanting a pet, budgie, compassion, crisis situations, family, feeding a baby wild bird, grandchildren and great-grandchildren, independently published authors, love, parental role, pets, raising birds. Bookmark the permalink.